Help is never far away in Pakistan and this morning is no exception. As it turns out the bus to Khaplu does not depart from the central stand, but a man with limited English points us down the road. He must sense our confusion and hails a taxi, helps load our bags and then gets in the front seat. A few minutes later we stop outside the entrance to an alley at the eastern end of the bazaar. It’s so non-descript I doubt we could have found it on our own. I give the man who has helped us 200 PKR, about 2 USD but he only accepts 100 for the taxi before placing his hand on his heart and bidding us farewell. 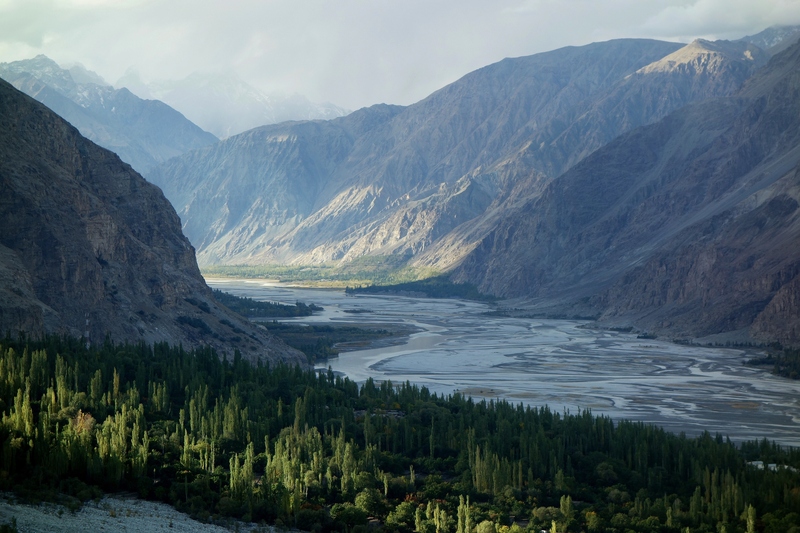 Khaplu is a little under 30km from the infamous line of control. In 1947 when India gained independence and Pakistan separated, both fledging countries claimed Kashmir as their own. They have been locked together in a high altitude stand-off ever since, with neither nation prepared to concede and agree on a permanent international border. With escalating tension due to recent insurgent activities, parts of the valley have become restricted. I am feeling somewhat apprehensive about our chances of reaching Khaplu considering we only have photocopied passports, no guide, no permits and a visa due to expire in three days. We pass through two checkpoints without being noticed. Sitting in the back corner behind the others passengers we evade the scrutiny of the army, but after crossing a green suspension bridge we are stopped again. Emma pulls her scarf over her head and I pretend to be asleep with my face in my arms. For a few minutes we sit praying we won’t be spotted but then we hear a tap on the window. I am escorted from the bus and told to take a seat in a tent that acts as a makeshift office. The interrogation is polite but laced with concern and doubt. Photocopied passports and soon to expire visas are not helping the situation. I explain that we have been waiting on our Indian visas for several weeks and our passports are still in Islamabad. More confusion, more concern. I try to settle the situation by explaining our passports will be returned to Skardu in a few days and we will be extending our visa. We are just passing time in Khaplu while we wait. This is a complete fabrication. In reality we have yet to work out how we will get our passports back and if the office in Skardu will even grant us an extension. He picks up the radio and explains he will seek advice from his supervisor due to unusual circumstances. What will happen if he says no? You will be sent back to Skardu and detained! He holds a finger in the air as he speaks into the two way radio. Among the foreign conversation I manage to catch incrementing words and phrases like, no passport, no guide, visa expire, India. Well that sounds promising. Even I begin to doubt my intentions here. I can’t be certain what is said in reply but he reaches for a book and starts entering our details. Okay, my supervisor has said you can proceed to Khaplu, but you must return in three days and attend to your visa extension in Skardu. If you don’t, you will be detained. Yes sir, thank you very much, we shall return in three days. He seems so good natured that I am left wondering how serious his threats of detention actually are. I push my concerns momentarily aside, relieved to have acquired three more days of breathing space. The bus has been waiting for nearly 20 minutes when I return. If the other passengers are annoyed or frustrated they certainly don’t show it. In fact they smile and seem somewhat jubilant that we are allowed to proceed with them. I ponder how my countrymen would react if the situation were to be reversed. 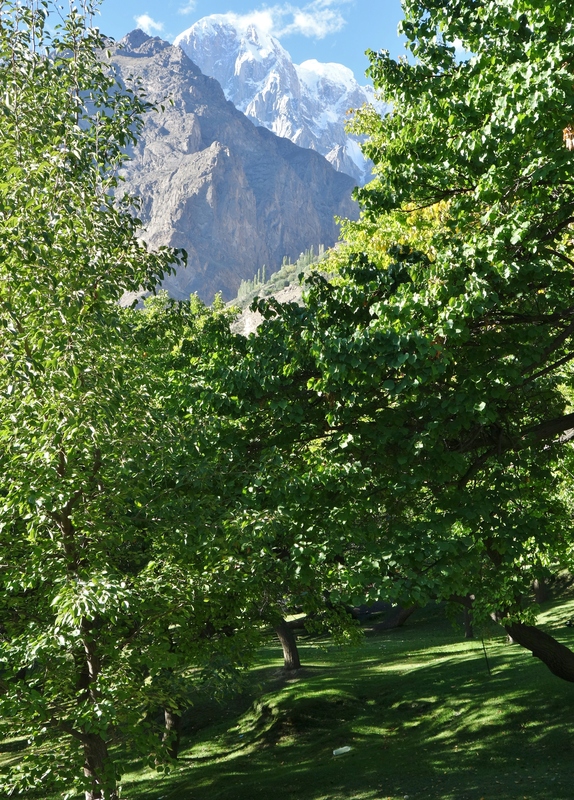 The streets of Khaplu wind up a gentle slope shaded under green leaves and dappled light. It’s a delightful and enduring village of irregular shaped houses and walls that give way to tree trunks and branches. To the east and across the valley is a vast barrier of stone rising into the clouds. 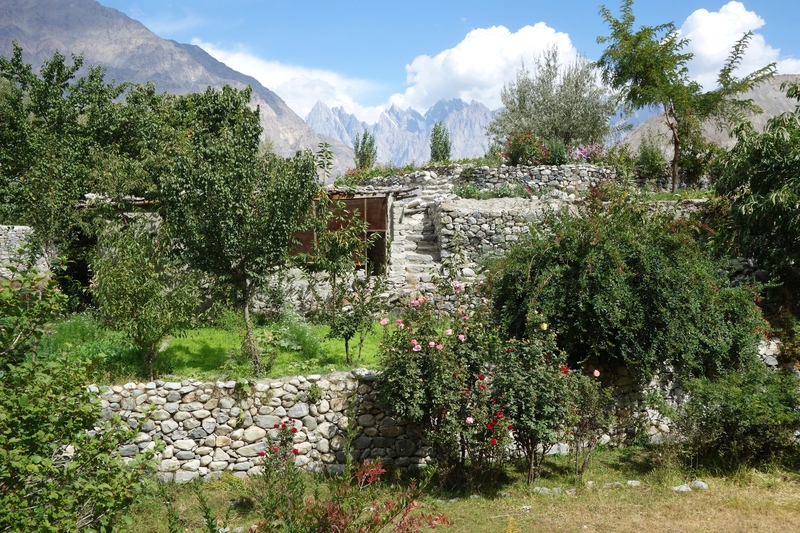 At the top of the village and free of the tree line is the magnificent Khaplu Palace. 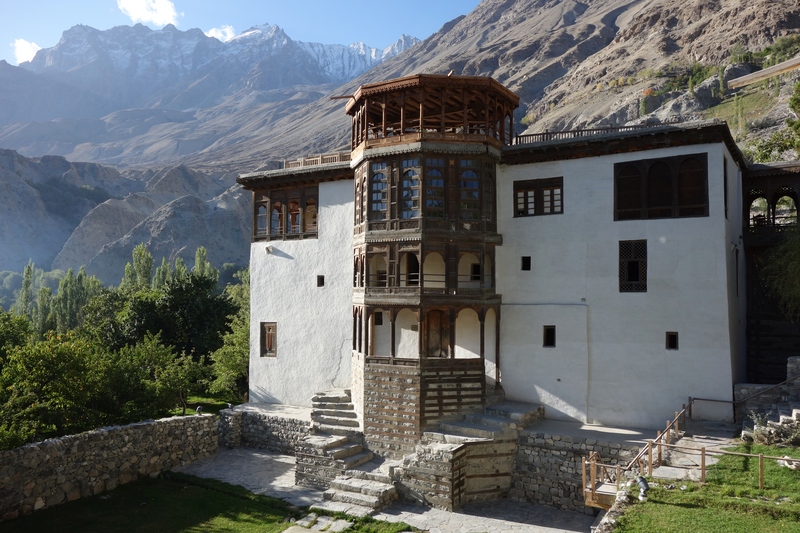 It’s an attractive building similar in design to the Baltit Fort in Hunza. Inside are six wonderfully restored suites. The Manager of the property Mr Abbas is as charming man, warm and welcoming. He insists we are shown all the rooms before checking in. We are directed in particular to the Raja’s suite with its own private terrace and harem room. 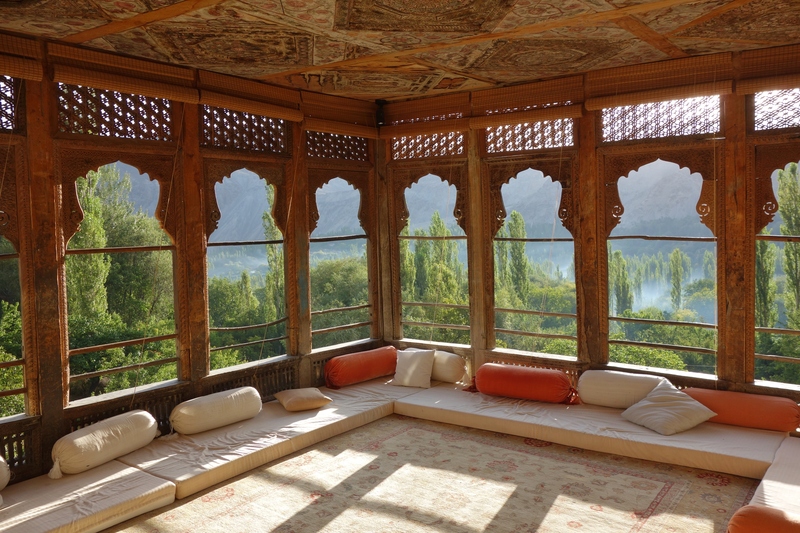 The main terrace is breathtaking with Arabian arches, Persian carpets and cushions from Kashmir. The ceiling is painted with roses and lit with soft lamps. The efforts in reaching here have been rewarded. I stare out across the wild and overgrown grounds that adjoin the palace. It’s like a secret garden with wild flowers and twisted old apple trees. 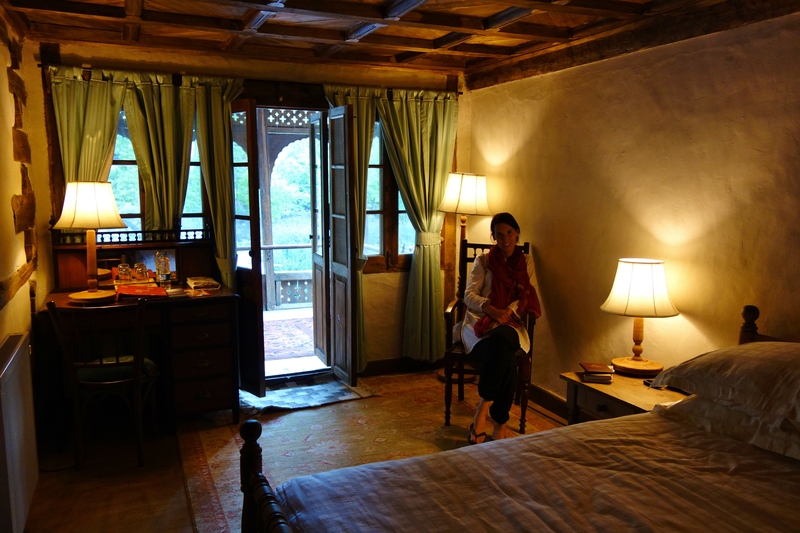 Having been completely overwhelmed we decide to spoil ourselves and take the raja’s suite. Later that day we receive a call from Irfan in Islamabad. The visatronix office will not give him our passports because our supporting letter has not been stamped. Stamped by whom, what stamp are they talking about? Irfan passes his phone over and I explain that he has the original collection slips and a signed letter authorising him to collect on our behalf. You are also talking to me on the phone, plus I emailed Mr Zia who confirmed this was sufficient… can you please give him our passports. The phone goes down, there is some background conversation. Irfan picks up again and lets us know he now has our passports in his possession. I will call you back when I get to Rawalpindi. An hour later Irfan calls from the bus station. 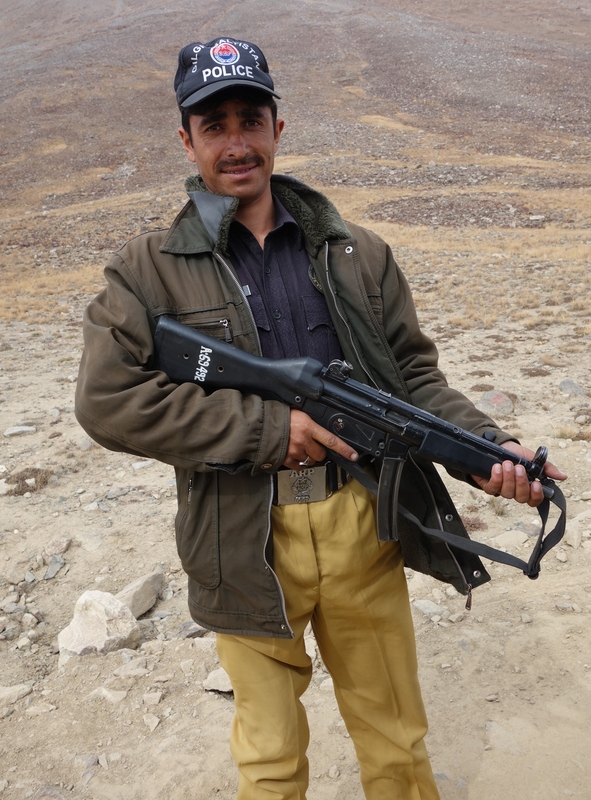 I have found a friend who lives in Gilgit and is taking the bus back tonight. Do you want me to give him your passports? The future of our journey is now attached to a total stranger. I can hardly believe it has come to this. If they go missing now it’s all over but we have put ourselves into a position where options are limited. How well do you know him, I feebly ask? I can feel the rush of blood that comes with gambling and hesitate trying to consider choices I don’t have. We go all in, and tell Irfan to hand over the passports to the bus driver from Pakistan. It will take another 24 hours before they arrive in Gilgit and we can be finally sure they are in safe hands. That night I lie in the Raja’s bed unable to sleep. Emma is of the belief that the Palace might be haunted, but there could be any number of explanations for the odd noises we hear. Certainly the Islamic hymn before sunrise is a beautiful and haunting experience. With perfect pause at the end of each line, it echoes gently off the surrounding mountains. I somehow feel comforted and reassured. Despite the early hour and warm bed, I am pulled to the window. Khaplu sleeps under a black sky filled with an audience of stars. I sit by the window listening to that melancholy call. The air is still. The trees are frozen, there is no movement, no other sound and only once the hymn ends do I feel the morning chill. Like any time of anxious wait, the day passes slowly. We go for a walk around the village attracting attention from stray children and goats. Already some of the trees are dressed in autumn colours but the town remains for now mostly green. Steam rises from the fresh earth that is being turned in the fields. We pass a colourful Mosque that is tightly enclosed by the surrounding houses. It’s difficult to get a good view but we wonder around the tight streets optimistically. A young girl no more than 16 looks alarmed to see me, but then relaxes when she sees Emma. I politely keep my distance while Emma is welcomed with warm curiosity. Emma explains we are trying to see the Mosque. The young girl takes us inside her house and onto the roof where we get a splendid view. A woman in her mid to late 30’s nurses a small child. As it turns out she is the grandmother and our young tour guide is the child’s mother. We have travelled far in our journey but have yet to find another place so distant and timeless as these valleys in Kashmir. The scale of the mountains and isolation is captivating. It’s like being in a fairy tale, Sleepy Hollow and Brigadoon. I find myself drifting further away from the world outside, paralysed and unwilling to leave. Later during my wonderings I come across a dozen or so children playing a game of cricket. They see me and come running. The sun is setting but the umpires seem reluctant to call bad light. I am handed the ball. The young batsman wearing a full Pakistan kit narrows his eyes. I rub the ball on my pants which brings raptures of laugher from the crowd. There is not much room for a run up but I shuffle my feet quickly before releasing a deadly yorker. The little buggar charges me and drives me for six. The crowd is now chanting Pakistan, Pakistan. Australia’s dignity is in grave danger. The ball is returned and another delivery is despatched to the boundary. The crowd swells and now even little girls are joining in. I decide to come around the wicket and clean bowl him. In a disgraceful act I charge down the pitch shouting and showing him the way to the dressing rooms. The crowd is now chanting Australia. The young lad is clearly a good sport and pats me on the back. I feel a little sad walking away. For thirty minutes in my life I have played with these kids and I will probably never see them again. I can only hope the young boy with the killer drive will one day open for Pakistan in a real test against Australia. That night we get good news. The passports have arrived in Gilgit and Habib has kindly offered to bring them to Skardu; a bus journey of just over six hours. We make our way back the following morning to meet him. The officer at the checkpoint reminds us that we only have 1 day left on our visa. 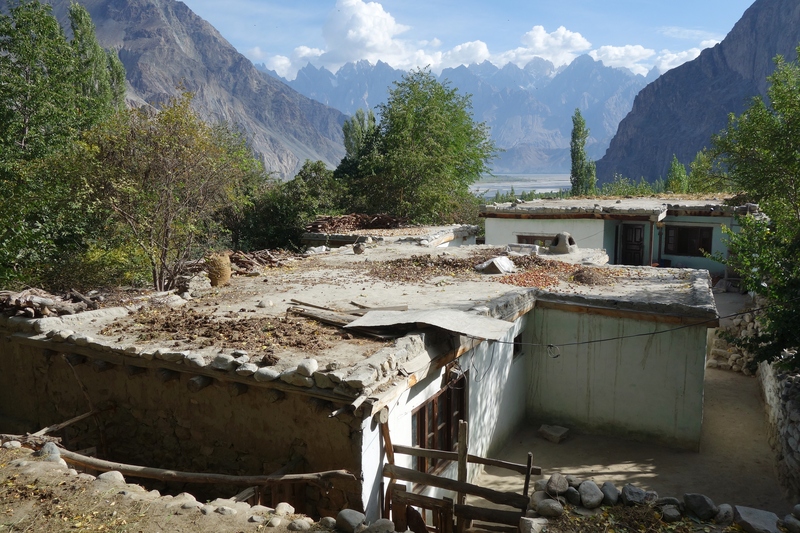 The PTDC hotel in Skardu is now deserted. The climbing and trekking season finished weeks ago and now just a handful of local tourists remain wondering its cold corridors. There is a knock on our door, its Habib. He welcomes us warmly, it’s good to see him again after so many weeks. He reaches into his money belt and hands over our passports. It’s the first time we have seen them in just over a month. I flick impatiently through the pages searching for validation and reassurance. The Indian visa is there, we can continue, but we still have the issue of our expiring Pakistan visa. 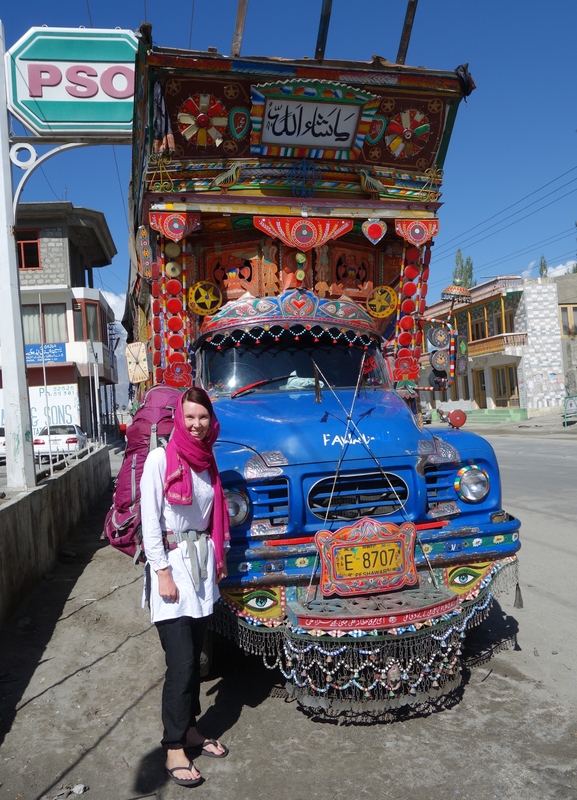 With just a day left, we go to the Passport office in Skardu which is only a 100 meters east of the PTDC hotel. A three page form is filled in with a letter from the hotel confirming that we are staying with them. The office also requires two passport photos. I ask the officer in charge for 30 days but he seems a little unwilling and offers 20. I politely explain that we want to stay longer and will need a week to make our way to border with India alone. He accepts our request and issues us a 30 day extension. Habib seems surprised as the officer in Gilgit strictly issues 15 day extensions. It’s a great feeling to have prevailed. The hard work has paid off but we could not have done it without the help of our friends in Pakistan. We owe them greatly for their help and assistance. Now that we have extra days at our disposal we make plans with Habib to travel further up the valley to even more remote villages. It would be such a shame to leave with the full beauty of autumn now only a few weeks away. 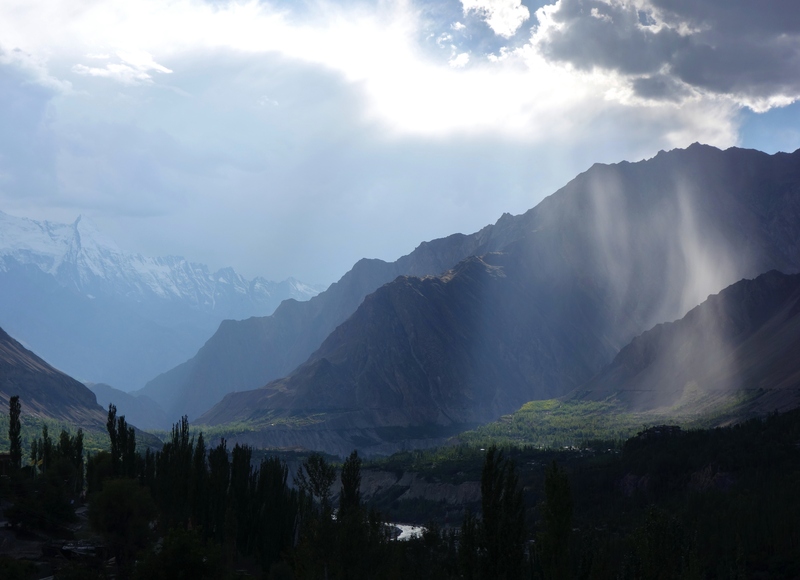 There is a change coming to the Hunza valley as we ponder our next move. The mornings are crisp and by mid-afternoon the shadows are long and cold. The village is still green but there is just a hint of gold in the leaves. Each day I pass a pink rose. When we first arrived it was in full bloom but now only a few dry and stubborn petals remain. It’s the first change in season we have experienced in over a year. Having crossed the equator back in late May and travelling through the tropics, we missed the southern autumn and winter and went straight to summer again. Now in the north of Pakistan the seasons have finally caught up with us. Soon the valleys will erupt with autumn colours. Gold, yellow, red and orange. It feels so close that we have to stay but our passports are in Islamabad with only 7 days left on our Pakistan visa. The TCS office will not courier them to us and if we leave to pick them up there is no returning on that dreaded 24 hour bus ride. Irfan (who used to work at the Madina and is a cousin of Habib now lives in Rawalpindi) is happy to help and offers to collect them for us. If we can get them back to Gilgit or Skardu it’s possible we can extend our visas. 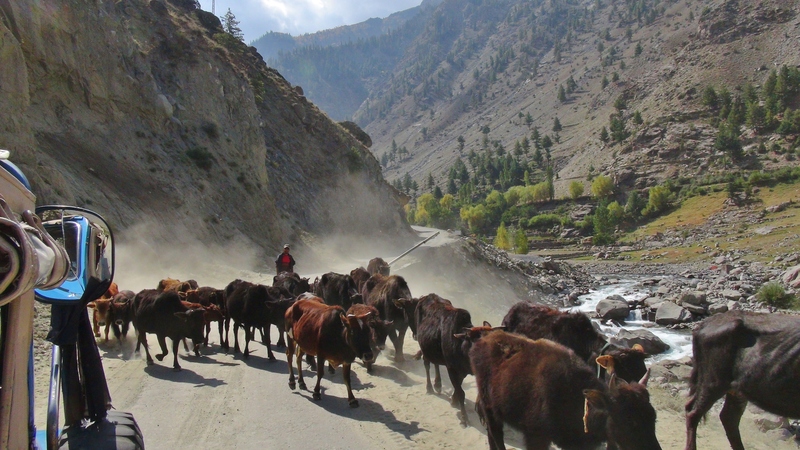 We take the risk and in the interim head to the Khaplu Valley via Astor the Deosai Plateau. The town of Astor is not particularly attractive and a little underwhelming when we arrive. 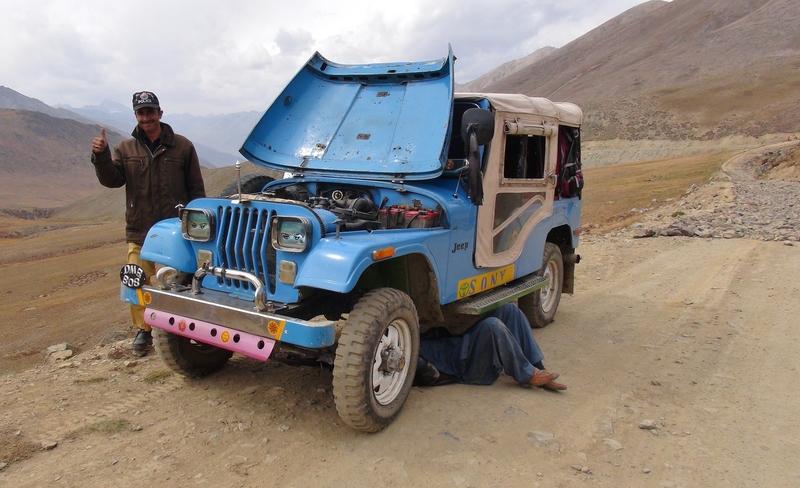 In order to cross the Deosai you require a 4WD. The starting price for two days hire is 25,000 PKR or about 250 USD. It’s a ridiculous offer but the driver and his contact sit silently absorbing our feeble protests. We call Nasir on the phone to seek his advice. My mobile is passed to the driver. I can hear Nasir talking loudly, the driver remains very quiet. The phone is passed back and Nasir advises he will take us for 15,000 PKR. We shake hands and try to load our bags in the back but the driver insists on carrying them for us. Once a deal has been struck, its full service. Before we can leave the local police instruct that we must take a guard. 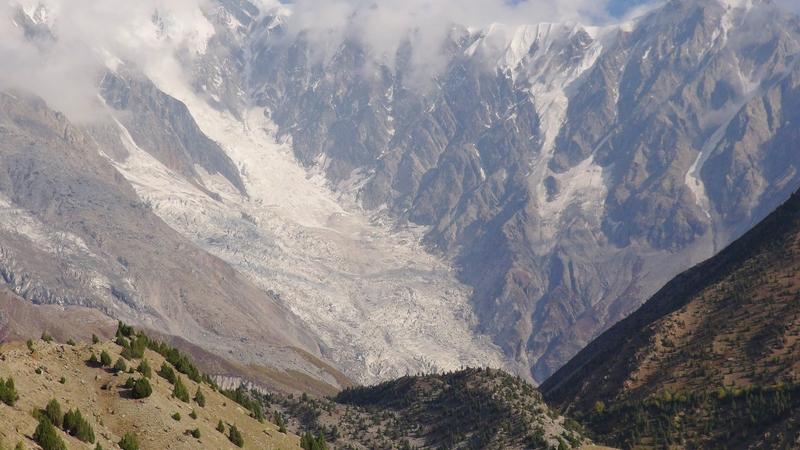 Since the terrorist killings of tourists at Nanga Parbat base camp the local authorities in certain areas have been very strict. Our guard arrives armed with a moustache, machine gun and a nasty habit of hawking and spitting. By the time we leave Astor its late afternoon. Tarashing is only 40km away but the condition of the road reduces us to a crawl. The Jeep has open sides and bad suspension. The light fades and soon we are enveloped in total darkness. We bounce along a deserted black road with two men and a machine gun. Our headlights struggle in the obscure surroundings. I can hear a river somewhere to our left when the guard stops clearing his throat. There are no signs of life ahead not even the smallest flicker of light. The road climbs higher, the night grows colder and the hawking intensifies. This moment was never something I imagined when planning our trip, yet despite hunger and an uneasy feeling, I feel charged and excited. An hour later and the feeling of excitement has passed. Where are we going? What are we doing? Can this man… just clear his throat… and shut up! We pass a stone wall and pull into a dark compound. Several men emerge from a gloomy kitchen. I crawl out the side of the jeep, my eyes trying to adjust to the starlight. Surely this can’t be our accommodation. One of the men speaks a little English and takes us upstairs. We inspect the room with a torch which is probably best. We have arrived in Tarashing, a village yet to be connected with electricity. The bed is flat and the blankets smells clean… in the dark. When I ask about the price the man insists we are his guest. We take a meal of potato curry and rice. They even have some flat mountain dew. The guard who spits returns with the local commander of police. He insists we are safe and there is no need to worry. We are under his protection. Safe from whom I wonder. Being told not to worry is always a little a little worrying when sat with strange men and candlelight. My mind drifts. I amusingly consider that our driver has Nasir’s number and will know whom to contact for the ransom at least. In reality our hosts are charming and polite gentlemen. Making an effort to reassure us in a language foreign to them for our benefit. After dinner we retire to our room and lock the door. I fumble through my bag for our iPod. Every time I turn it on, I can’t help but to think of its recovery in Uganda. We listen to a couple of episodes of the Ricky Gervais Show on the portable speaker before falling asleep. Tarashing in the morning is less sinister than its cloaked appearance last night. It’s very early but already the towering summit of Nanga Parbat is bathed in sunlight. The Rupal Valley is heavily wooded with pine trees. Young children are already walking down the valley to school. As it turns out guests pay a 1400 PKR for lodgings and dinner?! 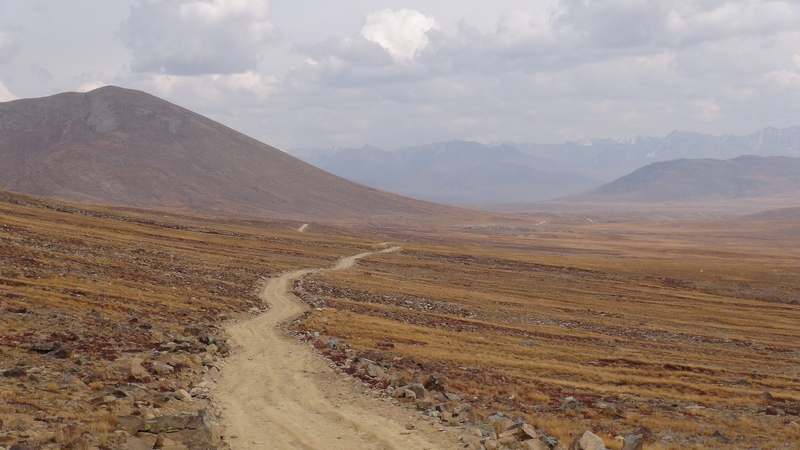 The distance to Skardu via the Deosai Plateau is only around 180km but it will take at least 8 hours. With this in mind we make an early start but our plans are soon foiled by a truck which is wedged under the cables of a suspension bridge. There is much shouting and arm waving. A metal bar is produced too little effect. In the end the driver dismantles the rear stays on the truck so we all can proceed. At the town of Chilam the police officer who still can’t clear his throat is finally and somewhat gratefully replaced. The army officer at the checkpoint though is very alarmed that we don’t have original passports and only 5 days left on a photocopied visa. To add to this we don’t have a guide. We assure him that our passports are already in Skardu and that we are travelling to collect them and renew our visa. He seems satisfied and allows us to continue after taking down our details. The pine trees and livestock thin as we climb higher. The Deosai plains at over 4000m are already in the grip of early winter. The grass and shrubs have turned brown. There is no explosion of colour up here, just a vast and beautiful dead expanse. Crawling over the rocks our jeep stalls and can’t be restarted. Our driver despite his prized leather jacket crawls under to arrest the problem. His attempts are fruitless. We all push so that he can clutch start it but the stones on the road stop us from generating enough speed. We reverse sides and push the jeep back down the hill. It gets wedged on a rock. Our new guard who does not spit digs it out and we start again. The jeep bounces over the rough rocks, the steering wheel spinning violently in the driver’s hands. At one point I think he is losing control and will bounce over the side but the engine roars into life. I consider our bleak surroundings and the empty road. The sound of internal combustion is music to my ears. The weather on the Deosai is becoming grey and grim. The driver closes the side plastic flaps but the cold wind still penetrates our jeep. This is a lonely place that will soon be snowbound for five long winter months. We push on through rain until we finally start our descent. A long series of hairpin bends. A motorbike passes us carrying two pained passengers. 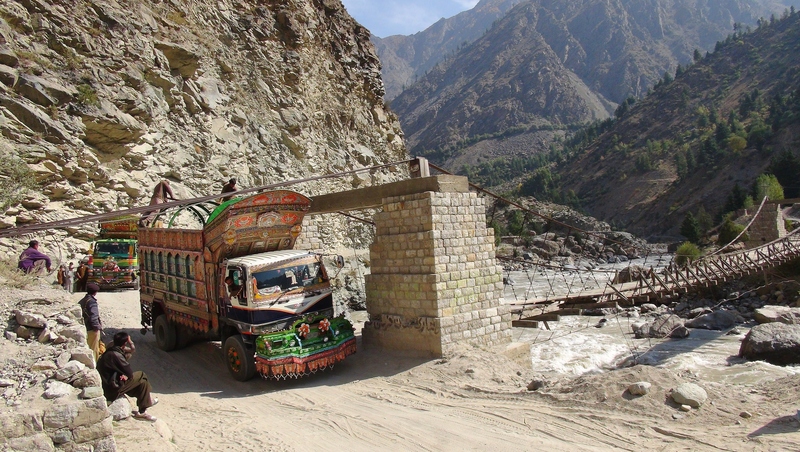 They have little protection for where they are going, but they are no doubt much tougher than I.
It’s miserable and late afternoon when we reach Skardu. The day that started in brilliant sunshine has faded to a gloomy and eerie end. Yet the despite the poor weather these landscapes remain captivating and beautiful. To the west the clouds are clearing a little. The sun’s rays are breaking through. The grey clouds start to glow, the peaks are turning pale rose. 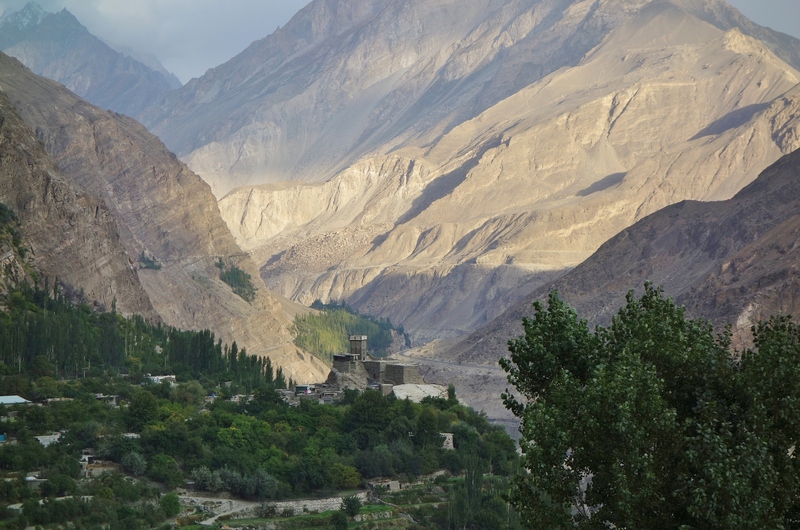 The Hunza valley is approximately three hours north of Gilgit along the Karakoram Highway. Despite the short distance our minivan stops for lunch at a shabby little restaurant next to an alfresco butcher. The tables are dirty, flies are abundant and the smell of meat is overpowering. There is an assortment of legs on the ground with hooves still attached. Hanging from a table are the heads of three unfortunate goats. Next to the legs is a pile of parts that can’t be identified. I survey the macabre scene, my eyes flicking back and forth between the food on the table and its origins. 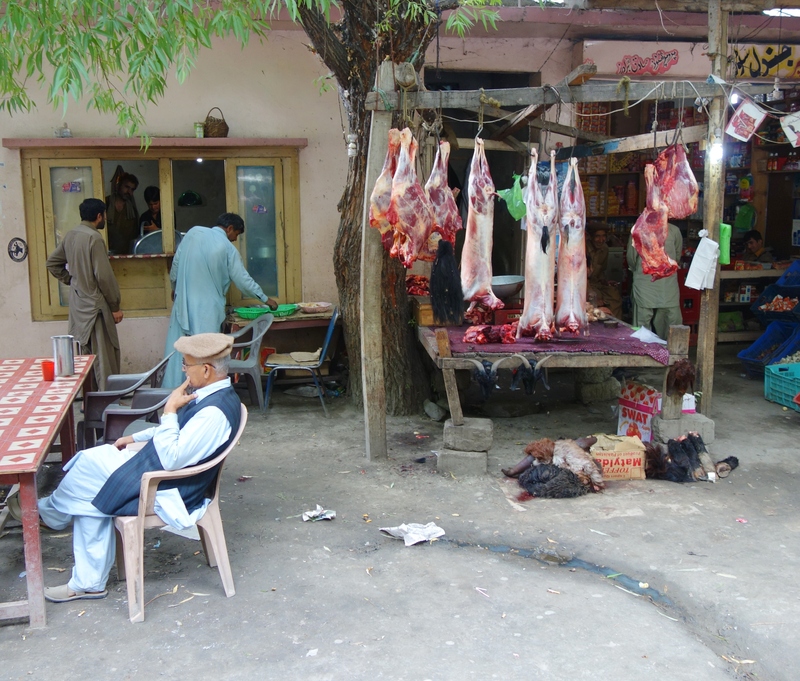 I can’t say this is a typical road side restaurant in Pakistan, but it does seem to be typical of our luck recently. In the end I settle for a can of coke which is consumed some distance away. By the time we reach the settlement of Karimabad the weather has turned nasty. Tall poplar trees bend in the cold wind, their leaves roaring with each gust. The sky is grey but yields only a few heavy drops. 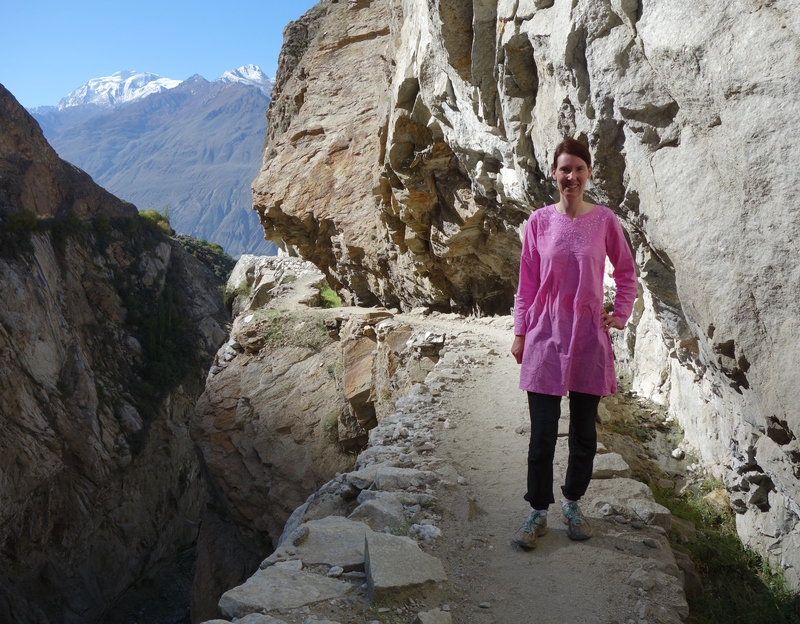 Above the village and perched proudly on a rocky outcrop is the Baltit Fort. For over 700 years it has guarded this valley. Its appearance is somewhat Tibetan with Moghul and Middle Eastern influences. 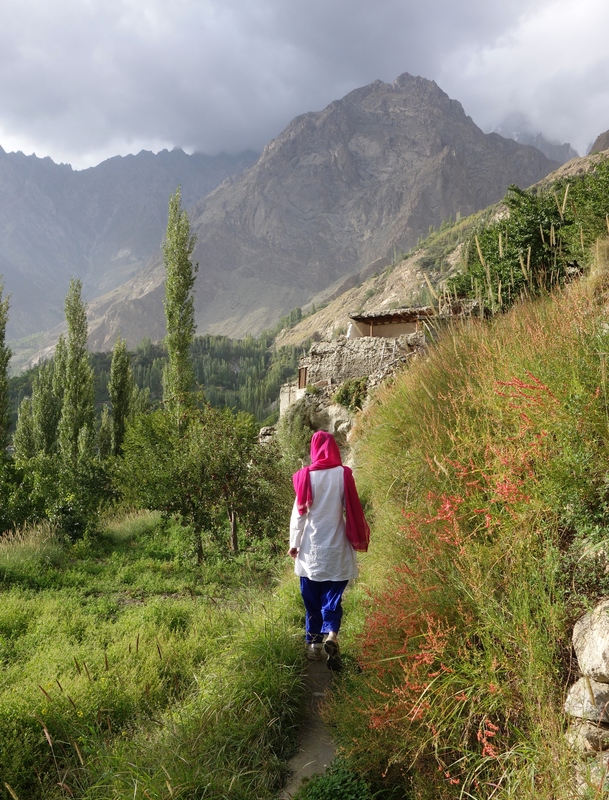 Karimabad itself seems more influenced by tourism. The main street is dotted with craft shops and there is even a café, but the tourists are now gone and most of the shops are closed. Behind the fort and partially hidden in the storm is the imposing peak of Ultar 7388m. Its flanks form a circular canyon with a steep narrow entrance and high green pastures. The Serena Baltit Inn has three tented rooms that are separated from the rest of the hotel. They are very spacious and the bed is by far the best we have slept in since leaving the Old Cataract in Egypt. The views across to the other side of the valley are equally impressive. 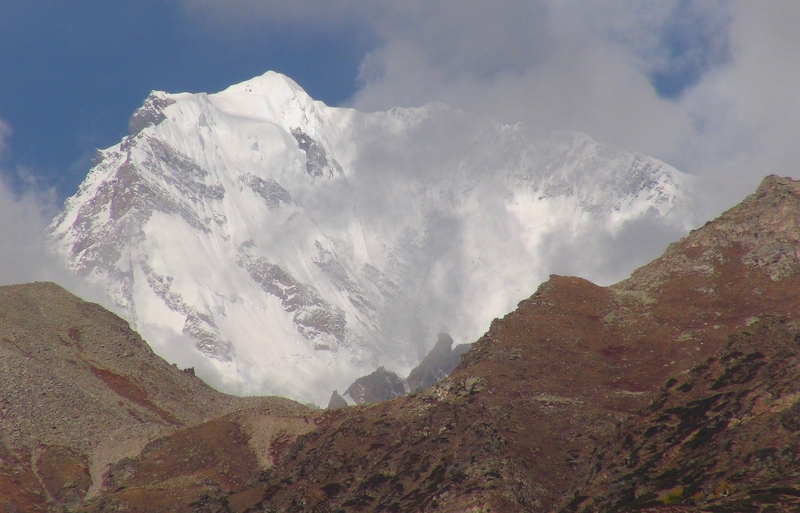 Rakaposhi dominates, its summit reaching 7788m. 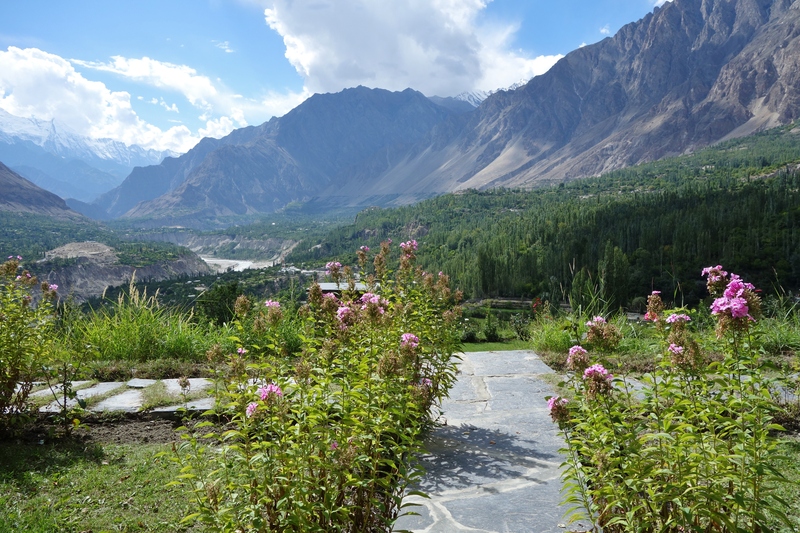 Outside is a lovely terrace and beyond a garden of roses and the Hunza Valley. It is a joy to open your door every morning to such a splendour. We have no idea how long it will take before the Indian Consulate will advise us on our visa application. What we do know is that our Pakistan visa will expire in three weeks. Having travelled so far and overcome so many obstacles we are in danger of being stopped. We discuss options but logistically they are almost impossible to conceive. 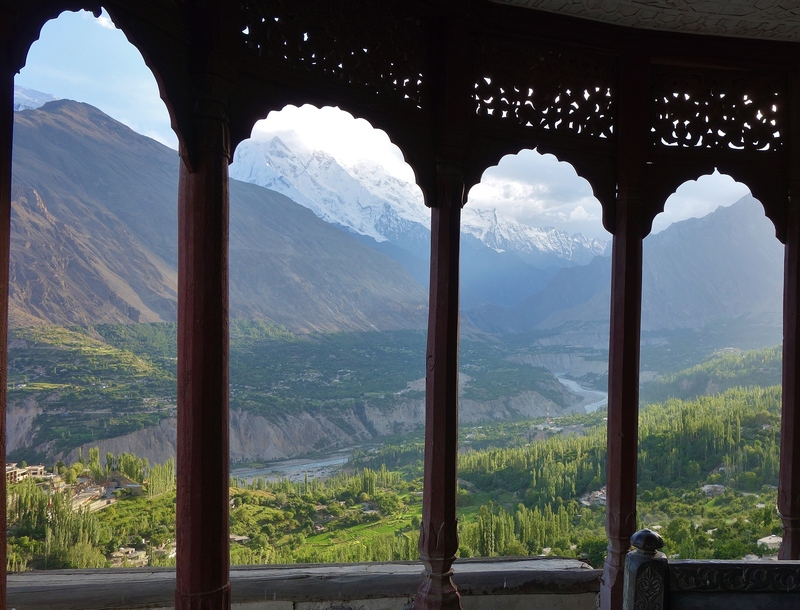 For now the Hunza valley is the perfect place to sit and wait. 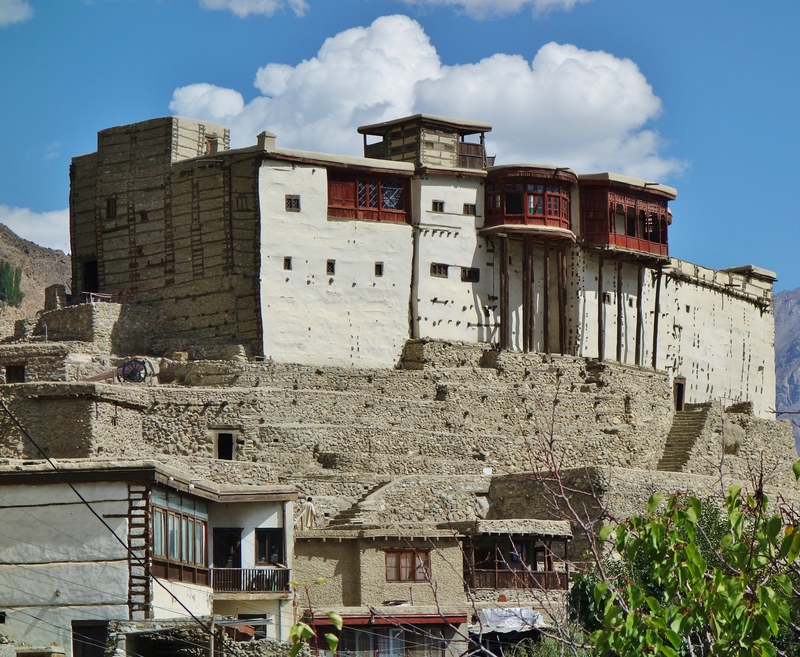 The Baltit Fort is a now a museum lovingly restored by the Agha Khan trust. 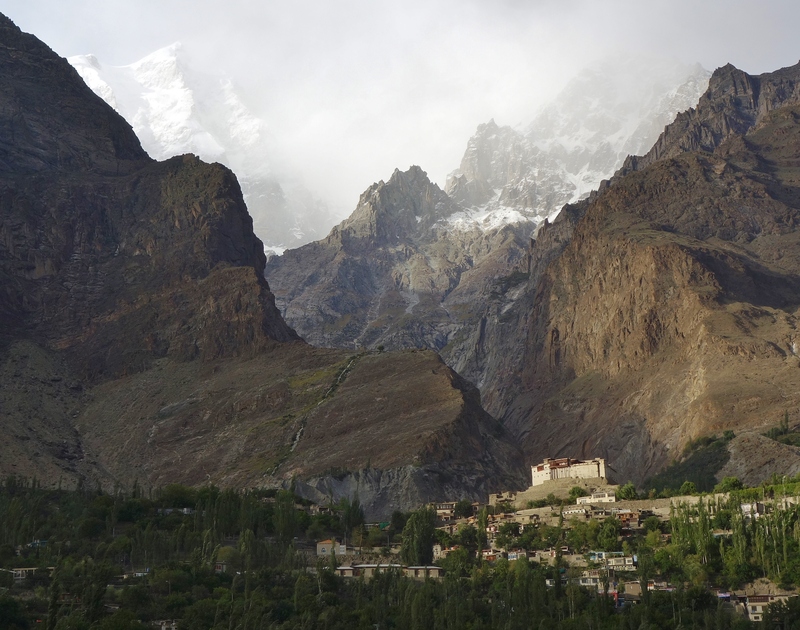 The fort used to belong to the Mir of Hunza but in a state of disrepair it was donated and given back to the local community. The restoration work is of a high standard. Each room is linked via small decorative wooden doorways. The walls display weapons from another time. The rugs on the floor are patterns of brown and cream made from natural wool and not dyed. We pass through dungeons, kitchens, court rooms and finally the gallery, where the Mir’s of the past would sit and behold their kingdom. If they were alive today the scene before us would still be recognisable to them. Fruits drying on the roofs, children playing with livestock. The mountains that are growing so slowly, unchanged in our short existence. We spend most of our mornings watching a movie on our laptop. By midday the sun starts to shine on the side of the tent making it uncomfortable inside. During the afternoons we walk along the irrigation channels to the next village of Altit. 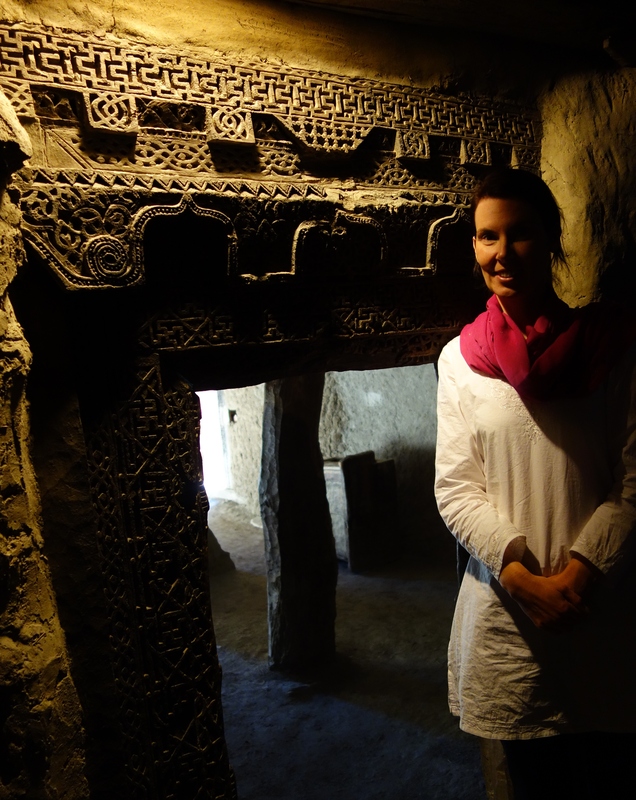 A return trip that takes a couple of hours if you don’t stop to chat with the locals. At the centre of the village is the Altit Fort. 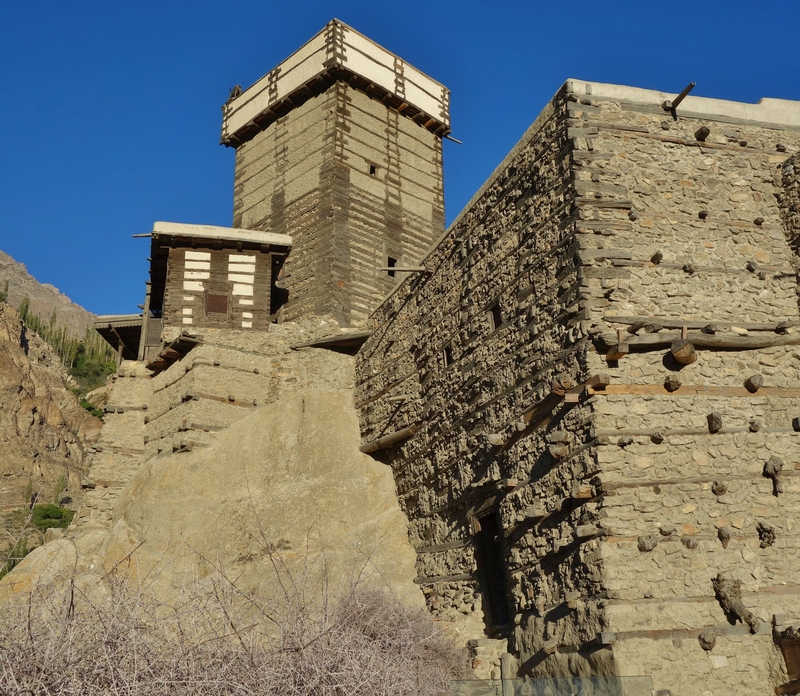 A medieval stone keep that predates the Baltit Fort by over 150 years. The restoration here also includes repair and repatriation of the surrounding old village and two acres of gardens adjacent to the forts entrance. The gardens are terraced and shaded by apple, apricot and mulberry trees. At the centre is a small lake with a willow tree. Its long weeping branches hang down to the surface. Water from an irrigation channel empties into the lake. It gurgles in the background. Sunlight bounces off the ripples onto the bright green maple leaves above. The wind blows a little and shards of light filter through the canopy. To our left is a small flock of sheep grazing. A short distance away one has become separated and is being tormented by a well organised squadron of black birds. It bleats and runs in confusion. We spend a few lazy hours here, an excellent place for a picnic. The interior of the Altit Fort is very similar in style to the Baltit Fort, just on a reduced scale. The doorways if possible are slightly tighter and there is less light inside owing to the small windows. The Altit Fort was designed less for residence and more for military purposes. Its southern wall blends smoothly into the stone cliffs upon which is sits. 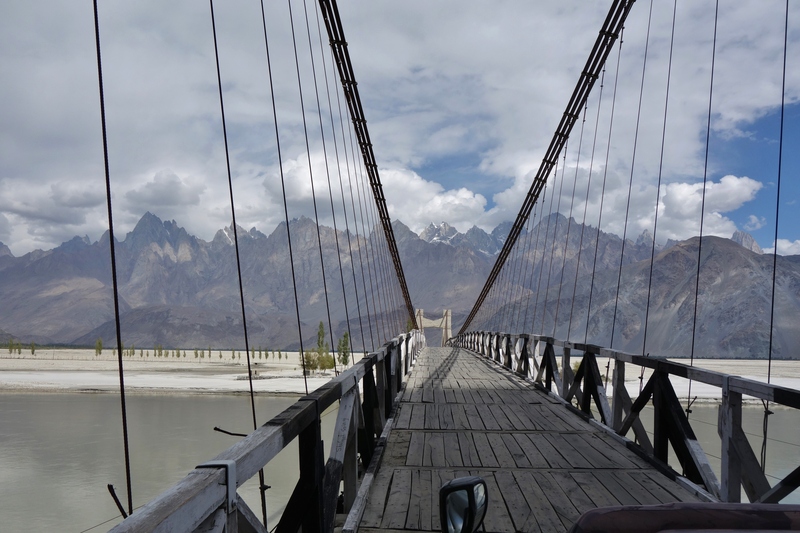 The fall to the Hunza River below is over a thousand feet. Tales tell of prisoners who were cast from its ramparts into the turbulent waters far below. I peer over the edge wondering about the unfortunates who met their demise here in the past. The height is dizzying so I step back less someone in modern times join them. It’s been nearly two weeks since we left our passports in Islamabad and still there is no news regarding our visa application. Each day we check our email with disappointment. Our other concern is the diminishing number of days left on our Pakistan visa. We are locked in a race of which we have no control. It is a worry, but if necessary we shall have to overstay our visa and deal with the consequences. I wonder what those consequences might be. Research on the internet range from fines to imprisonment! I find it difficult to conceive that given the good nature of Pakistanis that the later if indeed the former would be enforced, but I start to formulate yet another sob story in my mind nonetheless. 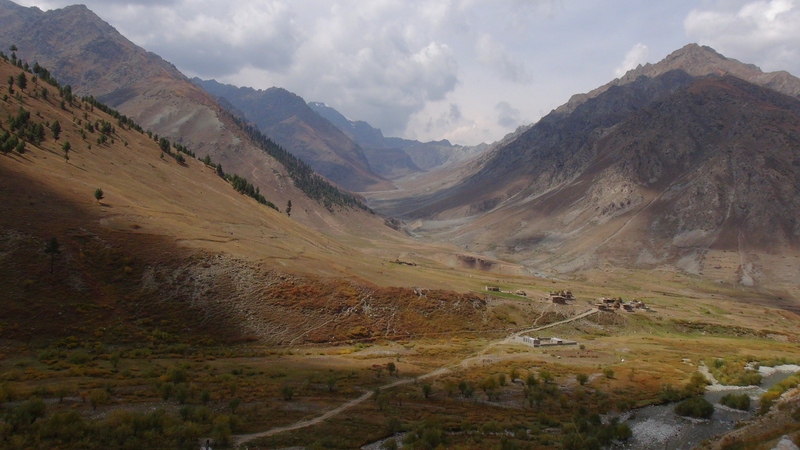 Behind the Baltit Fort is a narrow canyon that leads steeply up to some high pastures known as Ultar Meadows. Finding the path from the village is an adventure on its own, but once located the real fun begins. It tracks around the steep cliff three feet wide but with a long drop to the glacier below. The stones are to be navigated carefully. A trip here would be fatal. The path is eventually swallowed up by the side moraine of the Ultar Glacier. From here to the pastures above is two hours of climbing over rocks. We leave cairns or small piles of stones in order to navigate our way back. Almost three hours after setting off we reach the shepherds hut in Ultar Meadows. During the summer the farmers bring their livestock up here to feed on the lush grass, but now in early autumn most of the animals are gone and the pastures are turning dry. 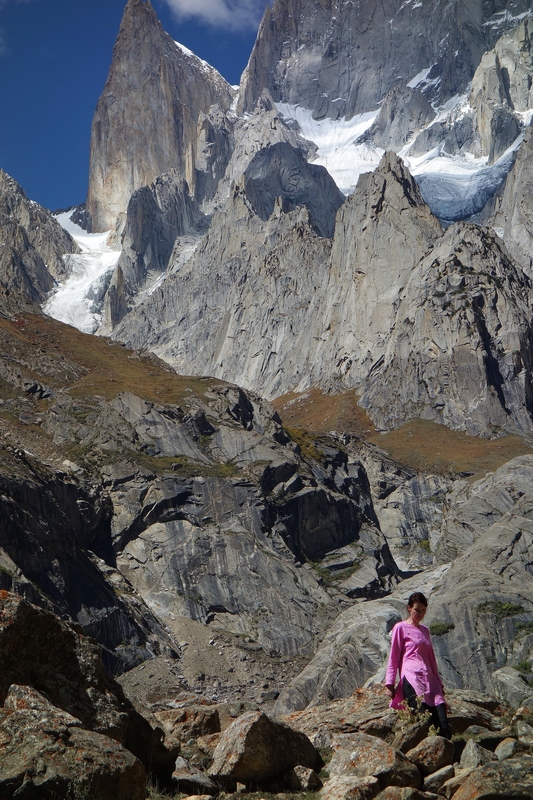 Towering above us is the north face of Ultar. The Ultar glacier above looks more like a waterfall of ice cascading down. Next to Ultar is the unmistakable shape of Lady Finger Peak. A 6000m high finger of rock perfectly shaped like a thin cone. Its walls are so steep that snow is not able to take hold. Having seen many mountain vistas, I can attest that few can compare with the beauty and severity of Ultar Meadows. 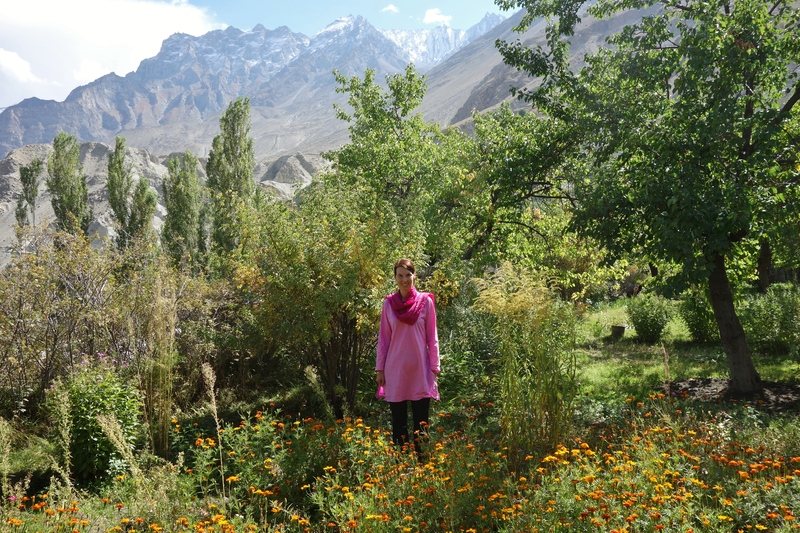 We bask in the sun for a couple of hours before making our way back down to Karimabad. Despite travelling downhill the slope and lose surface make for a difficult return. Our cairns are hard to spot among the sea of rocks but we manage to find our way back to the path without too much difficulty. Upon our return we receive an email from the TCS visatronox office. Simply saying that our passports have been returned. There is no other information. What does this mean, it sounds promising but there is no mention regarding our visas. It’s late in the day but we send an email anyway asking for more details. After waiting for three weeks we now have to wait another day before we can be truly sure. Its maddening frustrating but most of all exciting. The next morning and the internet is not working! The tension grows. We go for another walk along the irrigation channels. Not far from the Altit Fort is a lovely farm with wonderful views of the mountains. Neat rows of corn are browning. Large orange pumpkins hang along the dry stone walls. There is a feel of harvest time and Halloween in the air. We have been admiring the farms beauty for several days. A young girl comes bounding up the stairs and asks us to come and sit in their garden. Her English is excellent and we take a seat under a grape vine. Her younger sister has fair hair and blue eyes but is too shy to talk. Sania is 16 but carries the confidence of an adult. Her mother washes some peaches and grapes in a stream. A short distance away is a small stable made from rocks and twisted dry branches. Inside is a cow, two goats and four sheep, two of which are young lambs. It is an enchanting scene. The peaches are juicy and messy to eat. You can never imagine that such encounters await you when you set off on a journey like this but they happen every day. We are constantly blessed by the people of the world. Passed along from one to the next. By the time we reach Karimabad the sun is setting. Oddly we feel no sense of urgency to check our emails. We wait a while and enjoy the last light. The internet is back up and we log on. Sitting in our inbox is an email from the TCS office. We open it with fatalistic calm. This is the moment when we find out if our overland journey ends or continues. The message is brief and to the point. Dr Mr Reynolds confirming with you that your Indian visa has been issued. Please advise when you will collect. I can feel the adrenaline that comes with anticipation and relief. It has been a long wait but our overland journey can continue. Singapore feels just that little bit closer. There is only one problem. Our Passports are in Islamabad and our Pakistani visas expire in 7 days. We have time to go down and collect them if we leave right away, but the beauty of Kashmir is strong and we want to stay just a little longer to see the change of season and the autumn colours bloom in the valleys. The TCS office can’t courier them to us, they must be collected in person. The thought of travelling down and returning again is unimaginable.